Living a successful life, achieving your goals and reaching your dreams are all about doing small things daily that will make your life better each day. Don’t get it wrong by thinking that being successful is about taking one bold action or making one big decision and you will be successful. Success often comes from small daily actions that we do, day in and day out. It is not so much about doing something big. What you do once in a while is not as important as what you do every day. How you live your life each day matters. And that means if you want to live a better life, you have to start by adopting positive daily habits that will get you the life you want. It is our day-to-day habits and actions that will determine our success. 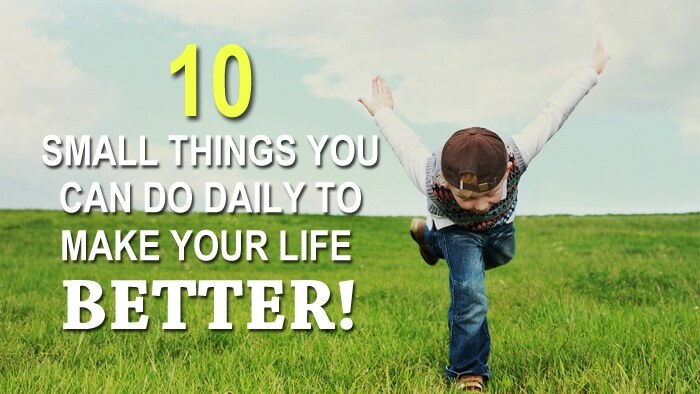 So here are 10 small things that you can do each day to make your life better. Every morning when you wake up, declare to yourself that it is going to be a great day and something amazing is waiting for you. Have you heard about the self-fulfilling prophecy? What you think, you become. And this is how you can make your day great by starting your day with good intention. You don’t even have to say out loud. Just think in your head and feel the positive energy and great feeling within you. Almost magically, you will feel alive and can’t wait to start the day. If you don’t believe me, just try to do it starting from tomorrow onward. If you scare you might forget about this, just put a “Post-It” note on the mirror as a reminder. Of course, you don’t have to use the exact words I declare to myself each day. You can create your own declarations or affirmations if you would like to call it. When you start your day with the right feeling, you set yourself in the right mood and state throughout the day. This is a very small action that anyone can do to make their life better. You should also do this and start your day with great feelings. One of the biggest differences between successful and unsuccessful people is that successful people always think about their goals and their dreams. They think about what they want to achieve in their life all the time. On the other hand, unsuccessful people think about menial stuff such as what to have for dinner, who has updated their Facebook, what games should they play, where should they go or what movie should they watch this weekend. Thus, if you want to be successful, you must start by adopting the right mindset and think like successful people. This is why you should revisit your goals and your dreams daily. One very powerful habit you can develop is to practice daily goal setting. You write down your goals every day. Brian Tracy, the success guru encourages his students and readers to practice daily goal setting too. You see, when you are reviewing your goals and dreams every day, you are actually telling yourself that these are the important things you want to achieve in life. This action shows that you are committed and serious about achieving the things that you write down. If you are not committed, you will never bother writing down your goals and dreams. Besides that, you also “install” what you want into your subconscious mind. This is how the Law of Attraction works. So practice daily goal setting. You can do it in the morning before you start your work. If you think that you don’t have the time for this, just get up 30 minutes earlier to do this. Show yourself and prove to the universe that you are serious about achieving your goals. If you want to make your life better, you must do something about it. You must take action to get there. Don’t just set your goals, write them down and then do nothing. You must take action to create results and move forward each day. Don’t get it wrong by thinking that as long as you write down your goals every day, you can achieve them automatically without putting in any hard work. Even if you want to win a lottery, you still need to take action to buy or get the ticket in the first place. I love the “Big Five” strategy from Robin Sharma. Sir Robin suggests people to take five small action steps to move forward each day. And if you can do this for a year, you will have accomplished 1825 small victories. And these 1825 small victories will definitely transform your life for the better. All you need to do is to focus on taking 5 small actions a day. If your goal is to become a best-selling author, what are the 5 small things you can do each day? If your goal is to build a million-dollar internet business, what are the 5 small actions you can take every day? If your goal is to build a successful blog that has a million readers, what are the 5 things you can do each day to get there? So just start off each day by taking 5 little actions. You just need to take a few steps closer toward the life you want and you will eventually reach there. We all know that exercise is important, but are we doing it every day to make sure we have a better health? It is said that being healthy is the most important key to success in life. There’s no point have a million dollar in the bank if you suffer from chronic illness and have to live in the hospital. Thus, take care of yourself and exercise daily. Our bodies are created to move. You must at least spend 15 to 30 minutes of exercise and sweating each day. If you are busy, spend 15 minutes to exercise. Follow through some workout sessions that you can do anywhere. You can check out those workout examples from YouTube. And if you don’t even have 15 minutes to exercise each day, you don’t have a life. Do you know that most successful people use their morning time for exercise? People such as Richard Branson, Jack Dorsey, Ursula Burns, Indra Nooyi, and Michelle Obama spend their morning time to exercise. Successful people understand that if they want to accomplish more and do deliver better quality work, they must make sure that they are at their top form each day. And the only way to achieve this is through taking care of their health. And thus, the first thing that they do before they start their day is to exercise and get sweat. Exercise makes you healthy, more productive, more creative, and more energetic and relieves your stress. And not to mention that it makes you happy as well. If you want to know what most successful people do before breakfast, read the book, What The Most Successful People Do Before Breakfast. When it comes to making your life better, you must learn to better connect with others. We cannot live alone in this world and we cannot achieve great success by ourselves. If we want to achieve more, we need help and assistance from other people. Do you really think that great people like Steve Jobs did it alone? No, Steve Jobs started with his good friend, Steve Wozniak and a few others while in college. The same goes for Walt Disney. Walt Disney has his brother; Roy Disney, to help him in his journey to transforming the world of cartoon. What about you? Who do you have in life that can help you become better and to accomplish the amazing results that you want? 1) First, stay away from people who are ‘toxic’. And this means that you have to spend less time or totally let go of people who are going to bring you down in life. I believe that there will be people in your circle who are negative. They always think negatively. They like to complain and blame on whatever that is happening against them. I have a few of these friends and I try to connect with them less. 2) Second, make friends with people who will empower you. Jim Rohn said, “You are the average of the five people you spend the most time with.” And he is certainly right. The people you surround yourself with will influence your mindset and your life. Think about it, if you want to fly with the eagles, and then don’t swim with the ducks. If you want to get better in stock investing, don’t mix with people who don’t trust stocks and who don’t invest at all. You have to join the right people so then you can perform and get better through your circle of influence. 3) Third, start to connect and build a relationship with people who can empower you. For example, if you want to build a successful blog, try to network with other successful bloggers who can inspire and share with you tips on how you can do better. This is because your conversation with these people will revolve around blogging. And when you discuss more on this topic, you will eventually become better because you learn more. And this is why the people you connect with are important. They can change your life. So if you want to do better in life, get to know people who are doing better than you in your industry. And connect with them. You cannot do better if you go through your day feeling bored and tired. Therefore, in order for you to feel lively, you must at least do something that will make your heart sing each day. Scott Adams said that he always has his side projects that interest him running. Even when he was still holding a job, he spent his free time building and growing his side projects. He said even the job that he was in was boring, but the moment he thought about his side projects, he felt inspired and are willing to go to work with more enthusiasm. You must do the same. What makes your heart sings? What is the thing that you love doing that will make you feel excited? One of the easiest methods to approach this is to list down your hobbies and pick one and do it right away. So write down 5 to 10 of your hobbies right now, and then include your hobbies into your daily schedule. Include at least one hobby into your daily life. If your hobby is to play games, you can include a 30 minutes gaming time into your schedule. If your hobby is to play tennis, then schedule it over the week. Make your life, lively. When you are living your life with enthusiasm and passion, you will definitely achieve much more than most ordinary people. You will be able to go through your boring job (if it is boring) with some drive because you know that something fun is waiting for you. So live your life with passion from now on. Do something that will excite you each day. It is true that not all your plan will work out perfectly, but having a plan is much better than having no plan at all. Most people live their life without a plan. They don’t plan their day and they have no idea what to do in their life. They go to work and wait for whatever that comes to them. They wait for instructions and they wait for things to come to them. In other words, they are being reactive. If you want to do better, live a great life, and achieve more success, you cannot be reactive. You must be proactive. Instead of waiting for things to happen, you are the one who should make things happen. Stop waiting for things to come to you, go for the things that you want. Don’t wait for instructions, be proactive and get things done. This is why planning is important. When you have no idea how to go through your weekend, you will certainly waste your weekends on things that don’t matter. You will play games, wake up late, watch excessive TV, check updates on social media non-stop or sleep the entire afternoon. Things will be different when you have a plan. When you know what to do, you will at least understand what you want to do and then do it. If you plan to read your favorite book you have just bought in Starbucks this weekend, most likely it is going to happen because you already have the idea in mind. Unless something more urgent occurs, your chances to read the book will be high. So plan your day, week, months and even years. What is life without happiness? Like health, there is no point to be successful only to find that you are not happy at all. To me, health and happiness should come first. And then only I can do better and perform better in life. Your mood will affect your life. When you are in a bad mood, you simply cannot focus and do a great work. Your mind will keep on thinking about the issue that makes you sad or angry. I guess it is right. Sometimes, you cannot be too serious. When a problem surfaces, just smile and get a good laugh and then continue to work on the solution. Studies have shown that your mood can indirectly influence your health. If you are always sad and angry, your chances of falling sick and getting ill will be higher than people who live happily. So learn to manage your state and live a happy life. How can you do that? Simple, your motions create your emotions. If you are sleepy right now, try to stand up and jump for 10 times. You will feel awake and energetic right away. If you are feeling sad right now, change your facial expression. Make a big grin on your face like you mean it. You will discover that the sad and negative thoughts will go away instantly when you do this. Our states or moods have been linked with our body motion and physiology through our minds. When we feel sad, our face will show it and vice versa. Hence, if you want to change your emotion, just change your motion. If you want to be confident, breathe, walk, talk and act like when you are confident, and you will become confident. So stop being too serious about life. Instead, smile and laugh more. Life will go on regardless of whether the mood you are in. So choose to live your life happily. Everyone has 24 hours a day and if you want to be productive, you must learn to maintain your energy. Learn to manage your energy so that you can concentrate on your work and perform better. It is no use to work for 20 hours a day and produce lousy work. I’d rather work for 10 hours a day and deliver an outstanding work. A lot of people get it wrong and thought that if they have more time, they will be able to accomplish more. This is only true to a certain extent. You cannot do great work when you don’t have the energy, feeling sleepy and tired all the time. Being productive is not about doing more. Being productive is about delivering quality work with lesser time spend. And to achieve this, you must maintain your energy level. 1) Use the Pomodoro technique. It means that you schedule breaks into your work. You can work for 30 minutes and then take a 5 minutes break. Repeat the process for 3 times and then schedule a longer break. The key is to schedule breaks into your work so that you will never suffer burnout. This method is very effective and you can try it out. 2) Take a power nap. Extraordinary people such as Thomas Edison, Eleanor Roosevelt, Albert Einstein and Leonardo da Vinci used to take power naps during their workday. Power nap should be short and it can be from 15 to 30 minutes. Now, taking nap is not time wasting, but instead, it can refresh and recharge your energy level. You will feel more awake and energetic after the nap. I will take power nap whenever I feel like it and usually, I do it in the afternoon. I want to restore my energy and keep my willpower high so that I can tackle the work at hands. You can try this if you want to. However, make sure you don’t oversleep and go into deep sleep mode. This will make you more tired and groggy when you wake up. So learn to manage and maintain your energy level each day. Remember, success is a marathon and not a sprint. Finally, to live a better life, appreciate whatever you have. If you don’t feel grateful, you will feel like you’re broke even when you have a million dollar cash in the bank. However, if you are grateful, you will feel like you’re wealthy when you don’t have much in the bank. And when you are grateful, you will feel like a success. You will feel like you are complete and able to do a better job in life. So appreciate what you have in life right now. Feel grateful for your pet, your wife, your computer, your car, your house, your phones, and everything. Appreciate your life that each morning you are able to wake up and breathe. You can practice writing down what you appreciate with a gratitude list every day. It will transform your life. Next, always review your accomplishments. Look at how far you have come and how much you have accomplished. Don’t feel pathetic because you have failed to achieve your goals, but instead, appreciate that you have tried and resolve that you will do it better the next round. Life is about making small improvements each day. Acknowledge your victory, even if it is as small as successfully making your bed, or successfully putting away the junk foods. When you acknowledge your small victory, you will feel good. And when you feel good, you will train and discipline yourself to do more of those actions. Success breeds more successes. So appreciate the things you have and acknowledge your achievements. If you have read up to this point, say “YES” to yourself. You have done something most people will never do. It’s an accomplishment you should celebrate. Feel happy about it. Don’t just read this for the sake of just reading. If you are serious about living a better life and achieving greater success, you need to do something about it right now. Make a change to your life by applying just one or a few of these small suggestions mentioned here. If you are just going to read this and do nothing, guess what, nothing will change. Thus, if you want to improve and make your life better, you must change. Start with small changes. Apply what you have learned here.